Click on a program below for details and availability. Programs take place at Varsity Hockey School (Brampton) or Scotiabank Pond (Toronto). The OPEN Pre Tryout Clinics are designed for all level students who want to be prepared for the team tryout selection process. This preparation format will include technical and tactical execution drills intended to sharpen technical skills along with challenging the reaction process of Read, Process and Execute that is level appropriate. There are 7 Clinics available to be pre-registered throughout the team tryout period and each clinic will provide 3 (three) one-hour sessions on 3 (three) consecutive evenings. CUSTOMIZED REGISTRATION AVAILABLE: 3 (three) or more pre-registered dates and times can be customized over consecutive weeks of the Pre Tryout program period. The ELITE Pre Tryout clinic provides high intensity team tryout preparation for selective Elite Profile students who are motivated to be ready for the selection process. The program is for APPROVED BY PROFILE students who demonstrate technical and physical skill proficiency that is complimented by a mature training focus. These qualities will allow the student to be challenged in a high tempo athletic and reactive type drill environment with the objective of building the ability to read, process and execute with effective and timely transitional explosiveness. The weekly FUNDAMENTAL Skills & Drills Clinics are structured around building the student’s technical skills. The training is targeted towards the Fundamental Profile student who is developing their technical skills and commonly ranges from 6 years of age and older. The program will reinforce the fundamental skills through the concentrated skill repetition of a weekly lesson plan. Training will be delivered by focusing on specific skills with the use of ‘Isolate’ and ‘Control’ training speed that is level appropriate. The weekly ADVANCE Skills & Drills Clinics are structured to challenge the student’s physical skills towards developing the Body and Edge Control required to execute with Power and Agility. The program is for APPROVED BY PROFILE students and is targeted towards Advance & Elite Profile student who demonstrates competent to proficient mechanics along with a competent understanding of tactical execution. The student will be challenged with drills executed at a Dynamic and Reaction training speeds and are appropriate for their level. The 5 Day Full Day FUNDAMENTAL Summer Camp is structured around building the student’s technical skills and targeted towards the Fundamental Profile student that commonly ranges from 6 years of age and older. The program will reinforce these basic skills through the concentrated skill repetition from a Full Day syllabus that focuses on specific execution keys with an ‘Isolate’ and ‘Control’ training speed that is level appropriate. 1 hrs CLASSROOM each day which includes review of student’s videos from On Ice sessions along with technical and tactical theory coaching. The program is for APPROVED BY PROFILE students who demonstrate competent to proficient technical and physical skills that is complimented by a mature training focus. The ELITE Performance clinic provides high intensity Off-Season on-ice training for selective Elite Profile students who are motivated to be ready for the upcoming season. These qualities will allow the student to be challenged by high level shooters in a high tempo athletic and reactive type drill environment with the objective of building the ability to read, process and execute with effective and timely transitional explosiveness. The Power Skating and Puck Handling Training program is designed to focus on a goalie’s Skating and Stick skills over a five (5) week special spring/summer program, providing 1 hour sessions. Sessions will also include understanding of Puck Handling skills when applying to defensive zone systems and break out tactics. The High Performer Program is a recognized Academic/Athletic specialized program that is offered through the Toronto District and Peel Region school boards with a compressed school curriculum. This specialized program accommodates the Student/Athlete to complete their education within a consolidated school schedule and provides the daily flexibility to incorporate the required training into a demanding sports schedule to achieve their athletic goals. The Varsity Training Centre High Performer Program is recognized by the Toronto District and Peel Regional school boards as a sanctioned hockey curriculum that is designed to develop young hockey Players and Goalies in all aspects of their sport. The strength of the VTC HP Program is founded on a development philosophy that provides the training resources and services necessary to progressively improve your child’s hockey skills. The VTC High Performer Program delivers their curriculum in the Varsity Training Centre that is a self contained full feature facility and is committed to developing all qualified and approved High Performer Program players and goalies. The High Performer Program is a school board recognized academic/athletic specialized program with a compressed school curriculum. Delivered from Team Shutout Goalie School Lesson Plans that progresses and develops performance skills in areas such as Goalie Specific Technical Execution and Game Situation Tactical Execution. The Players & Goalies lesson plans will incorporate Treadmill training to develop edge balance and stride. Player & Goalie 60 minutes Off-Ice training that will progress and develop the Power, Agility and Stamina needed to better execute on the ice. Are you committed to reach your potential and become the best goalie you can be. … then the LEVEL UP Program with Training + Performance COACHING is for you! The LEVEL UP program will supplement your on ice training plan with feedback features that will help you improve your in-game execution. The PRIVATE sessions program is One-on-One instruction that will provide close personal training. Initial lessons would challenge all aspects of the student’s current skill level with the objective of identifying observed weaknesses for continued sessions. The continued progression of lessons would be designed based on the development needs demonstrated by the student in the specific areas of Technical and Tactical skills necessary to bring consistency to their in game performance. Sessions are booked based on availability of ice and instructor. The TEAM Practice program is One-on-One instruction that will provide close personal training during team practices. Initial practices will challenge all aspects of the student’s current skill level with the objective of identifying observed weaknesses for continued sessions. The continued progression of practices would be designed based on the development needs demonstrated by the student in the specific areas of Technical and Tactical skills necessary to bring consistency to their in game performance. 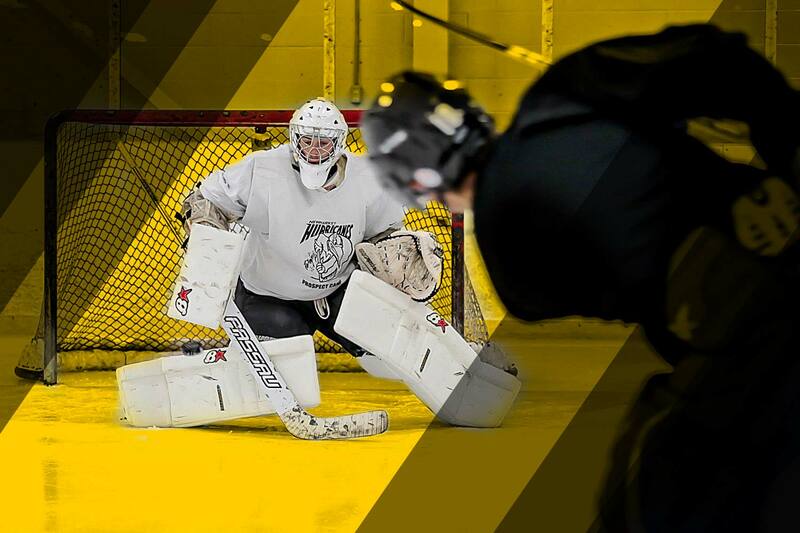 Sessions are booked based on availability instructor so contact us now to ensure the availability of one of our experienced instructors to attend your team practice to work with your goalies.